There is lots of things happening this season so SAVE THE DATES now. It's all kicking off with our Season Launch at Harbourview (Club sponsors for 2019) on Friday 5th April from 6:00pm to 8:00pm. The 2019 Players Kit will be revealed and Captains will be named. 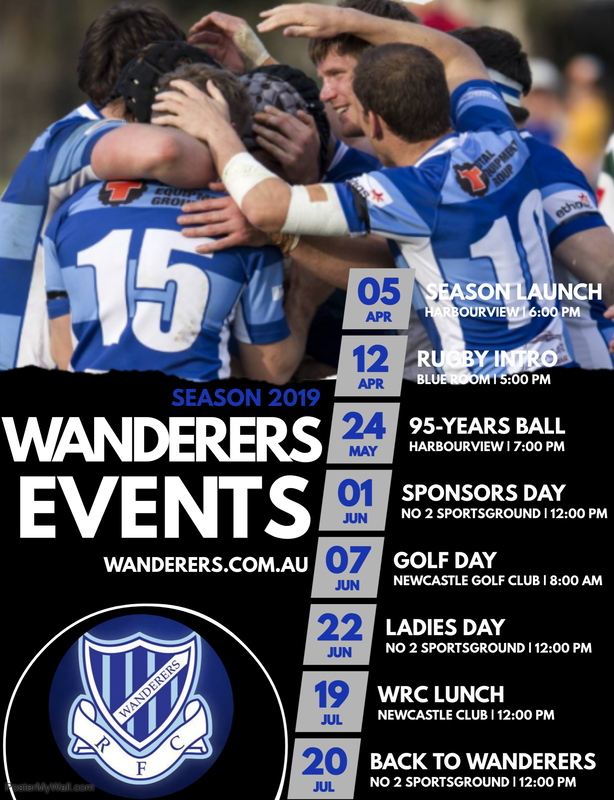 All sponsors, past and current players, supporters of the Club, Wanderers Rugby Community members, Juniors parents, the Women of Wanderers, Netball Teams and friends of the Club are invited to come along and help us launch the 2019 Season on the eve of Round 1. The Back to Wanderers Day on 20 July (v Merewether Carlton) is also the 2009 1st XV Premiers 10-yr Reunion. Another not-to-be-missed occasion for 2019.